There may be times when your garage door at home becomes unsafe to use, unresponsive or unsightly due to damage. It face many challenges, from the hardships of extreme weather conditions and simple wear and tear, to the ever-present possibility of accidents. When damage occurs, all is not lost. Our team of professional garage door repair technicians is here to assist you. Contact us today to find out more about our services. Door panels may receive damage due to a number of reasons, which can leave them looking unsightly while also lessening the effectiveness of your door’s security. Garage door panels can be replaced easily with the help of our technicians who are experienced in all areas of repairs on automated as well as manual garage doors. Many of the components that are associated with the functionality and safety of your doors will be damaged with long-term use. Parts may become worn down, warped through pressure or worse, weakened substantially from rust or galvanic corrosion. When these parts fail, you must replace them as soon as possible. 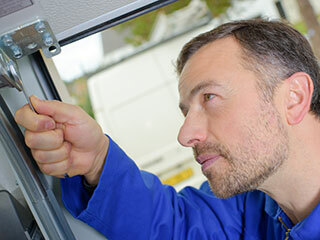 Contact us for details on our replacement and garage door adjustment services. Whether you need your safety utilities checked, need a garage door spring replaced or need to have your opener and its components replaced, our team has extensive experience and training in all areas of repairs, maintenance and installations for garage doors and their various parts. We also work with products from industry leading manufacturers, which means that we can source the perfect parts for your needs, and will replace them with professional care. If damage occurs to your garage door, it is often a priority to have it restored as soon as possible. If you are looking to have your door repaired by a trusted technician, or would like to learn more about our various garage door repair services, feel free to get into contact with a representative from Garage Door repair Newcastle today for further information.